The Fitness Plaza’s locker rooms are first class full service facilities offering a steam room, dry sauna, Jacuzzi™ therapy whirlpool, and changing areas with hair dryers, vanity mirrors to get ready for work and six showers to reduce waiting. The Fitness Plaza’s staff is proud of these amenities and ensures that all areas are cleaned and disinfected thoroughly every evening. In fact, we continuously clean the locker rooms during the day and Fitness Plaza managers inspect our cleanliness every morning and night. 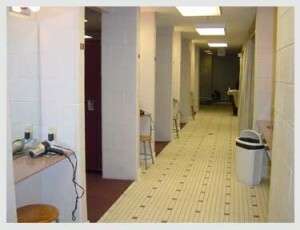 See the other amenities such as whirlpool, steam room and dry sauna that are located in each locker room.